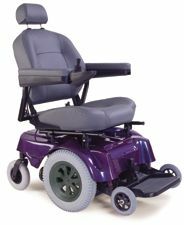 The Royal Deluxe 812 four wheel walker/ rollator offers so many features in a 4 wheel walker. The locking loop brakes offer added safety. Wheel locks add stability and the seat and pouch are standard. The height adjustable feature makes the Royal very versatile for most any user. The larger 8" wheels allow the user to travel over rougher terrain, yet the Royal DLX is still light weight at only 11 lbs. w/o basket, and will fold to fit in most any vehicle trunk or back seat. 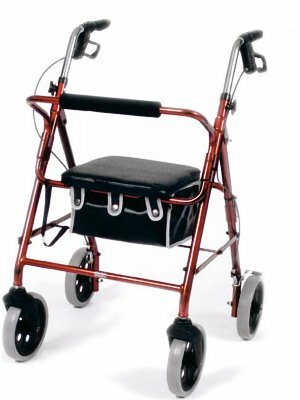 This walker will also fit in small spaces in your home, such as closets and even under the bed! The DLX also has a pouch under the basket for added storage. The Royal is available in many colors including: Red, Green, Champagne and Laser Blue. Folding Seat and pouch included. Available Colors: Red, Green, Champagne and Laser Blue. Seat Height to Ground 21"
Adjustable Height 31" to 36"